SuperKids Nutrition spoke with Maria Bournas MS, RD, LDN, a registered dietitian nutritionist, to help our viewers shop smart in the supermarket. Discover how to make healthy shopping a breeze for you and your family. Grocery shopping can be a daunting chore for parents, especially with so many choices for just one type of food. 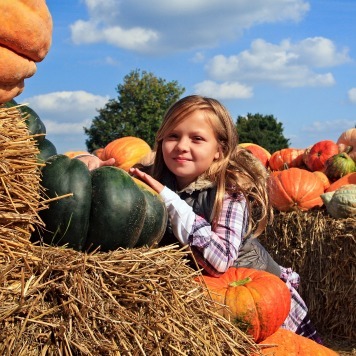 How would you advise parents in choosing the most nutritious foods for their children? At Mariano’s we use a scoring system called the NuVal Scoring System, which was developed by a phenomenal group of researchers led by Dr. David Katz from Yale. Most of our products are scored from 1-100, and the higher the score, the greater the nutritional value of the food. This comes in handy, for instance, when deciding which type of peanut butter, or yogurt to buy. I also always have full-time staff in the store, so customers can be assisted with any food-related questions. Parent tip: Ask your local grocery store if they have a registered dietitian on staff to answer questions. 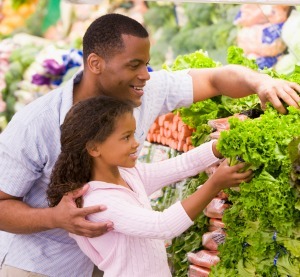 What are your thoughts on taking your child grocery shopping with you? 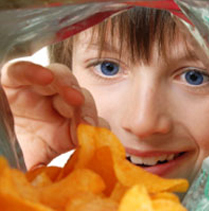 Do you believe there are benefits to including children in buying food for the home? It depends on the age of the child. By giving kids the choice between two or three options for various foods, it allows them to feel included in family decisions, and this can give them a strong foundation when they begin making independent food choices. What are the benefits of making a food list before going to the supermarket? Making a list is most useful when you are short on time and/or when you are hungry! Many people dislike grocery shopping, so for these people, lists can significantly cut down on their shopping time. Organize your list by food category to save time. Making grocery lists when shopping hungry is a must! If you are starving when you walk into a supermarket, you will want to buy everything in sight, which can lead to potentially unhealthy impulse buys! How can you save money and time when food shopping? Making shopping lists is definitely a time saver. A great way to save money is by checking the store mailings for weekly specials and coupons. Many stores have benefits linked to their membership cards or to their store brands. When you’re at the store, see which products are on sale, and try to substitute on-sale items with something on your list. And finally, stocking up on certain items like lean poultry when they are on sale, and freezing them for later use, is a huge money saver. Often times we hear dietitians speak of shopping “the periphery” of the grocery store. What are the benefits of this strategy? 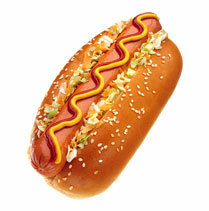 The periphery of supermarkets is where you will find most of your whole, unprocessed foods. The majority of your shopping should be done here. By stocking up on fruits, vegetables, whole grains and proteins, you will be getting a wide range of nutrients in your diet. However, there is nothing “bad” about the middle aisles if you shop smartly. It is important to learn how to read labels and ingredient lists, to make conscious decisions about the products you buy. We offer complimentary supermarket tours to customers who want to learn how to read food labels or to customers shopping for specific health conditions. Parent Tip: Read our article on Fooducate Blog about using their app at the grocery store with kids. How would you handle the situation if your child sees something in the supermarket that he/she wants, and you would categorize it as junk food? It depends on the situation. If you as a parent are okay with your child having a small portion of that food, there are many items that sell smaller, fun sized snacks, such as 100-calorie packs. This way, it is easier to control their portions. However, if you don’t want your child to have that food, then I would explain to them that this is a “once in a while” food and they can have one another time. Labeling foods as “bad” can lead to an increased desire for those foods. Parent Tip: Learn why foods should never be used as a reward! What are some of the most frequent foods you find on your grocery list? I work full time and have a 16-month old at home, so I try to have things on hand to make quick meals. Milk and eggs are always on our list, as well as peanut butter, apples, bananas, lettuce, tomatoes and avocados. My son also loves fish, so I usually have two different kinds readily available. We make a lot of soups, so I keep ingredients like lentils and canned beans in the house. Some families prefer to go food shopping once a week while others make a habit of going several times a week. What are your thoughts on this and how often do you personally go food shopping for your household? I tend to go shopping more often because I really love grocery shopping, and I also enjoy discovering new foods, like exotic fruits or vegetables I never tried or cooked before. It also helps that I work in a supermarket! I don’t think there is a right or wrong answer for this; I think each family has to figure out what works best for them. I know some families where the couple shops together, and others where only the wife makes the list and husband shops. If your system works, then stick with it! Check out SuperKids Nutrition and the American Institute for Cancer Research Grocery Store Tips, Recipes and Activities. Maria Bournas MS, RD, LDN is a registered and licensed dietitian in Chicago, IL. She received a master’s in Nutritional Epidemiology from Tufts University and is currently practicing dietetics at Mariano’s Fresh Market, a gourmet food store located in Vernon Hills, Illinois, which provides the freshest and highest quality products from all over the world. Shani a Registered Dietitian in the greater New York area. She has been working in clinical nutrition since receiving her Master's degree in Nutrition and Exercise Physiology.